Skips have been around and used widely for over 5 decades, during which time, skips have more or less remained the same. Big metal containers that are dropped off by a large truck, filled and then picked up and taken back to the depot for sorting. However, the UK skip hire industry is set to be shaken up by the introduction of skip trailers. What is a Trailer Skip? A trailer skip is in many ways a skip with wheels. Rather than having a skip carried on the back of a large truck, skip trailers are simply towed to the required location on their own wheels. As a result, the delivery vehicle can be smaller, and more economical, helping to save costs and gain access to tight locations. There are normally restrictions on the possible sizing of trailer skips, with most ranging from 2-yards through to a maximum of 8-yards. The available sizes are one aspect that make skip trailers attractive to the DIY industry, who generally only require smaller skip sizes for their home renovation jobs. Trailer skips also introduce the possibility for self-hire, with rentals being collected at the depot and driven to the required location by the renter. This would introduce on-demand skip hire, with clients having the ability to order and collect a skip at their own convenience, rather than waiting for a time slot when the delivery truck will deliver the skip. How is a Trailer Skip different to a Mini Skip? The most common trailer sizes are the 2-3 yard skips, or the same size as a mini skip. Whilst trailer skips and mini skips are perfect for the same purpose (small waste removal), they are quite different in many ways. Mini skips are generally open top, which means unwanted waste can be illegally added by members of the public, whereas skip trailers are enclosed and lockable, ensuring your waste is kept secure and nobody can fill your skip with unwanted junk. What are the advantages of hiring a Trailer Skip? One of the biggest advantages trailer skips provide is the on-demand service they will introduce to the UK. Today, DIY enthusiasts and commercial clients alike often want fast results, and skip trailers provide that ability. Skip trailers only need a vehicle with a tow-bar to be transported from one location to the next, which means that these skips can be booked and collected by a client within minutes, rather than waiting days for a traditional skip to be delivered by truck. As trailer skips do not require a truck for delivery, they can be delivered to more places. Trucks cannot get down or streets, and unloading a skip in a tight location can often be near impossible. Trailer skips enable skip providers to deliver a skip to even the most obscure locations, using smaller and more efficient vehicles. As our cities are becoming more congested, skip hire permits will continue to become more expensive. One of the biggest advantages of a skip trailer is that they do not skip permit. As they are technically a trailer, they can be parked on the street, without the need for a permit. This helps to keep costs down, and makes them extremely attractive to many clients, especially the DIY market. 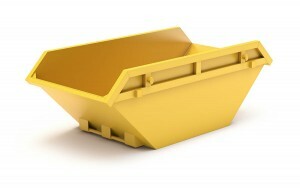 What are the disadvantages of a Trailer Skips? One of the most obvious disadvantages of a trailer skip, when comparing it to a traditional skip, is the cost. Trailer skips have more moving parts, and are more complicated to manufacture, meaning that they are more expensive to initially purchase. Upkeep costs are also higher with trailer skips, as they will require maintenance, as well as road registration. As skip trailers are towed, and often carry heavy loads, it is essential that they are in a roadworthy condition. Tyres will also wear out, and will need replacing. In terms of longevity, it is unlikely that a trailer skip would outlive a traditional skip, if exposed to the same conditions. Skips are tough and built to last, with no moving parts, however skip trailers are made from lighter materials, and have far more components which could potentially need repair or replacing. Who will use a Skip Trailer? trailer skips are most often used by domestic consumers. These skips are ideal for many DIY home improvement jobs, including garden clearances and kitchen refits, due to their smaller size. As you do not require a council skip permit, they will also be useful for jobs that do not have any onsite parking or space for a skip on the property. Some locations can simply not have a skip delivered, such as areas with restricted vehicle sizes, which will make a trailer skip a practical and useful alternative to the traditional mini and midi skips. Will trailer skips replace mini and midi skips entirely? No, the mini and midi skips that are popular throughout the UK will be here for some time to come. The skip hire and waste removal industry is continuing to grow, and it is likely that most people who hire a trailer skips will be hiring a skip for the first time. Skip trailers will be popular with DIY enthusiasts, who are working on their own home, completing smaller jobs. As observed in Australia, skip trailers are also generally hired for shorter periods of time, meaning that traditional mini and midi skips will be the more suitable choice for longer hire periods. In many locations throughout the UK, skip trailers will become a popular choice for consumers requiring a small skip as a result of not requiring a council skip hire permit. Trailer skips may also see a rise in many tool hire outlets and home hardware stores, which would further increase their popularity in the DIY market. Trailer skips are already extremely prominent in the Australian skip hire industry, and the UK is set to follow with this innovative new interpretation of the skip.